Once upon a time, sixty years ago, a little girl lived in the Big Woods of Wisconsin, in a little gray house made of logs (Little House in the Big Woods, page 2). Pepin, Wisconsin is only about two hours from our hometown, so we decided to take a day-trip to visit the birthplace of Laura Ingalls Wilder. 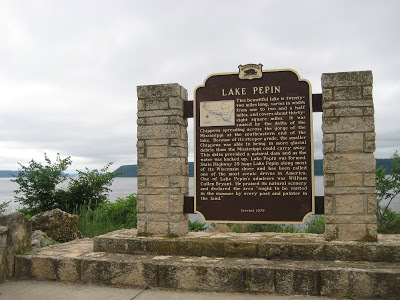 By the time we reached the little town on the shores of Lake Pepin, we were very hungry! So, before exploring, we ate lunch at a quaint cafe. Homemade sandwiches and soups did the trick. Afterward, we went to the Laura Ingalls Wilder Museum. 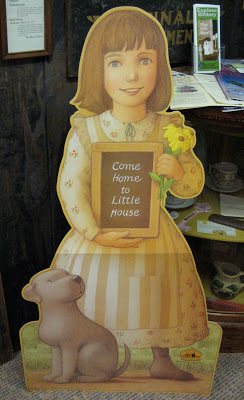 It contained a replica of a one-room school house, in which my girls wanted to spend most of their time. We pulled them away for awhile to show them photos and other memorabilia. Some of it was of Laura’s family, and some of it was just from her era. Nevertheless, it gave us a better idea about what life was like way back then. Oh, and we could not leave without buying some old-fashioned stick candy, now could we? Next, we drove about seven miles to the site of Laura’s birth. 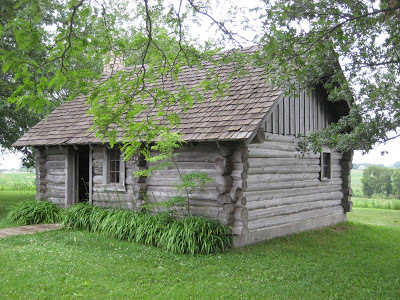 A log-cabin memorial (that you can actually go inside to get a feel for what it would have been like to live in such cozy quarters) stands there along with a sign describing Laura’s life. 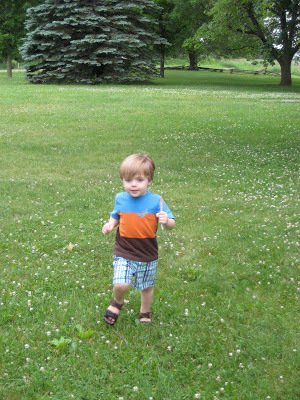 The one thing we didn’t get to do was wade in the shore waters of Lake Pepin. 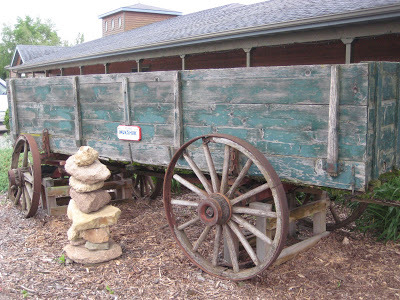 By the time we finished up with the museum and memorial, we needed to hitch up our wagon (not really) and head out, as we still had one more (non-Little House) stop to make before driving home. 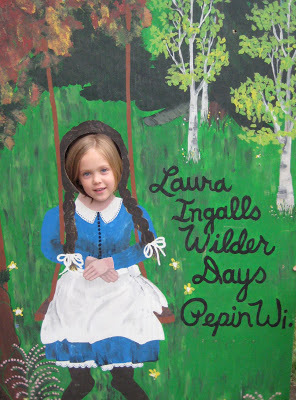 But that’s already on our to-do list for our next trip to Pepin, perhaps for Laura Ingalls Wilder Days in September! Oh, how fun and interesting!!! It's so funny how the real story is nothing like the tv show though! What a fun trip! Good memories. what a wonderful trip for your family. i am sure some very precious memories were made that day, sarah. i figure some day it'll get done and if not, then, oh well! the memories are more important than the scrapbook! This is so neat Sarah! My daughter would love to visit Pepin someday! I wanna go! OH that looks like so fun! Thanks for sharing this with us. I've starred this post so that I remember to consider going there this summer or fall. I bet my daughter would esp. like it. We finally have Little House books on the list for next year. This trip will be a must for us next summer – thanks for sharing! How fun! We've visited the one's in Kansas and Missouri. 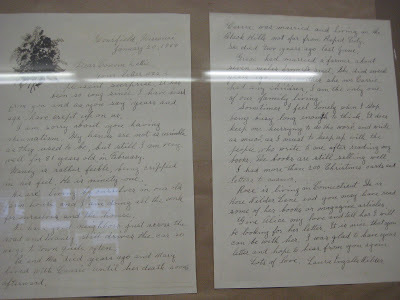 When we arrived at the site in Missouri, they ahd just finished their anuual celebration and the playing of Pa's fiddle. We just stopped by because we were in the area and had no idea the yearly festival was that day. We plan to go that way again and this time try to make it in time to hear the fiddle. Great post! I loved those books as a little girl. I still beat my eggs with a fork. I have put away the scrap booking stuff . . . I got my older two's begun (and left off with them at about age 1; the youngest has an album, not started – and you know they are now 16, 14, and 12). Oops! 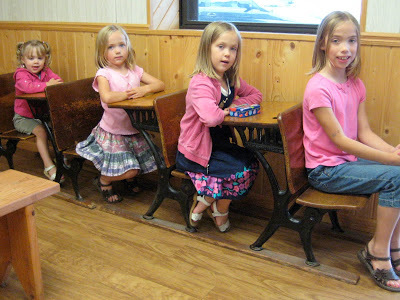 Love the pic of the tots in the desks! GREAT photo!